This entry was posted in Racing on February 7, 2011 by Steve Tilford. Don’t have much for you today. I woke up early and watched the last 30km live. I don’t know what is the matter with me. It is kind of amazing how few spectators there are at the finish. And at the start. They might as well be racing outside the Topeka city limits. I like it. Here are these guys that race in front of millions of people in July and are racing in front of dozens of people in February. And at a hard race at that. And the composition of the break. It is really surprising how many “sprinters” made that final group today. 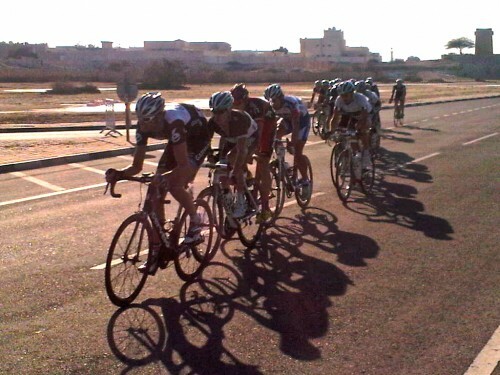 Renshaw, Boonen, O’Grady, Steegmans, Bennati, Roger Hammond, Jeremy Hunt, etc. Pretty unbelievable getting that selection in the crosswinds. Goes to show that positioning is so important. Boonen doesn’t seem to be having any knee problems so far this year. Watching, it looked like he went way too early, but that obviously wasn’t the case. 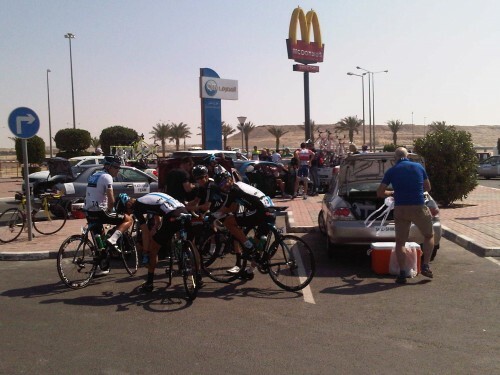 The race started in a McDonalds parking lot. How appropriate. Sean Kelly's team at the start. Break with 3km to go. I am sure there is no bike culture there to begin with – not even riding to be environmentally friendly – when gasoline still costs .35 gallon – LESS than water!